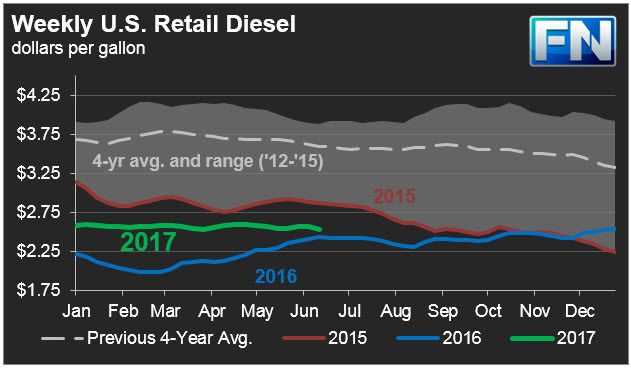 The Energy Information Administration (EIA) released its weekly data on diesel and gasoline retail prices for the week ended June 12th, 2017. The recent slump in crude prices was reflected in nationwide declines in retail gasoline and diesel prices. Prices for diesel decreased by 4.0 cents per gallon, while gasoline prices dropped by 4.8 cents per gallon. For the current week ended June 12th, diesel prices fell by 4.0 cents to settle at an average price of $2.524/gallon. PADD 1 retail diesel prices decreased by 3.0 cents to $2.569/gallon. New England prices fell by 1 cent to average $2.614/gallon. Central Atlantic diesel prices fell by 3.3 cents to average $2.711/gallon. Lower Atlantic prices dropped by 3.1 cents to average $2.459/gallon. PADD 1 prices were 12.0 cents/gallon above their prices for the same week last year. In the Midwest PADD 2 market, retail diesel prices dropped by 5.1 cents to average $2.454/gallon. This was the largest price drop among the five PADDs. Prices were 6.4 cents/gallon above their level for the same week last year. In the Gulf Coast PADD 3, retail diesel prices decreased by 4.9 cents to $2.368/gallon. This price was 6.1 cents higher than in the previous year. In the Rocky Mountains PADD 4 market, retail diesel prices declined by 2.0 cents to $2.644/gallon. This price was 23.1 cents higher than in the prior year. In the West Coast PADD 5 market, retail diesel prices dropped by 3.1 cents to average $2.805/gallon. This price was 9.4 cents above its level last year. Prices excluding California fell by 4.3 cents to $2.681/gallon, which was 7.1 cents above the retail price for the same week last year. California diesel prices decreased by 2.1 cents to an average price of $2.906/gallon, 11.5 cents higher than last year’s price. 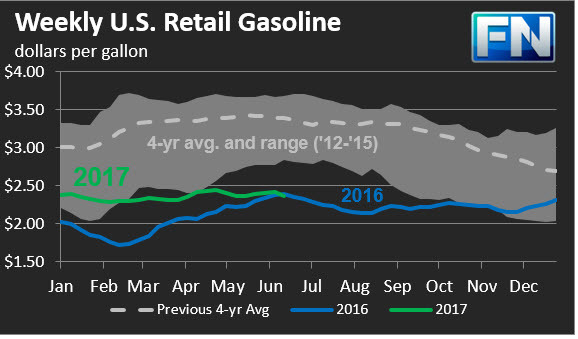 US retail gasoline prices dropped by 4.8 cents for the week ended June 12th, to $2.366/gallon. This drop was significant because for the first time in 2017, the weekly prices fell below the weekly price for the same week in 2016. Prices were 3.3 cents lower than for the same week in 2016. In the East Coast PADD 1, prices for gasoline fell by 3.6 cents to $2.310/gallon. This price was a scant 0.2 cents higher than last year’s price. Prices fell by 5.1 cents in New England to $2.349/gallon. Central Atlantic market prices fell by 2.4 cents to $2.431/gallon. Prices in the Lower Atlantic market dropped by 4.2 cents, bringing prices to an average of $2.207/gallon. This was 5.3 cents lower than last year’s average price for the same week. The Midwest PADD 2 market saw retail gasoline prices plummet by 7.4 cents to average $2.248/gallon. The PADD 2 market had the largest price decrease among the PADDs. Last week, PADD 2 was the first PADD to have prices fall below their levels of last year. Gasoline pump prices were 21.8 cents lower than they were one year ago. In the Gulf Coast PADD 3 market, gasoline prices decreased by 3.0 cents to average $2.141/gallon. Prices for the week were 0.6 cents higher than for the same week in 2016. In the Rocky Mountains PADD 4 market, gasoline pump prices declined by 0.9 cents to average $2.422/gallon. This price was 10 cents higher than at the same time in 2016. In the West Coast PADD 5 market, retail gasoline prices dropped by 5.0 cents to an average price of $2.892/gallon. This was 17.1 cents higher than at the same time a year ago. Excluding California, prices eased by 2.0 cents to an average of $2.642/gallon. This was 16.8 cents higher than at the same time in 2016. In California, prices dropped by 6.6 cents to an average pump price of $3.038/gallon. California remained the only state market to have gasoline prices above $3/gallon. Prices were 17.4 cents higher than last year’s price for the same week. Los Angeles prices dropped by 6.1 cents to average $3.009/gallon. San Francisco pump prices decreased by 5.0 cents to average $3.147/gallon, 21.8 cents above last year’s price. Seattle prices decreased 0.8 cents to average $2.861/gallon, 23.3 cents higher than prices one year ago.